Basseterre, St. Kitts (CUOPM) — St. Kitts and Nevis has told the 58th Session on the Commission on the Status of Women that the twin-island Federation that there is a sustained, nation-wide programme underway that provides funding and training to women in traditional, lower-wage fields of employment in order to equip them to compete in higher-income, traditionally male areas of economic endeavour. “I am also pleased to report that St. Kitts and Nevis has made tremendous strides towards achieving the first MDG – to eradicate poverty. Our government has invested heavily in creating a solid and expansive social protection programme aimed at assisting vulnerable families to lead dignified lives,” Minister of Health, Social and Community Development, Culture and Gender Affairs, the Hon. Marcella Liburd told the United Nations session in New York. She noted that like much of the western hemisphere, St. Kitts and Nevis from the 1600’s forward endured centuries of extreme oppression based on race. 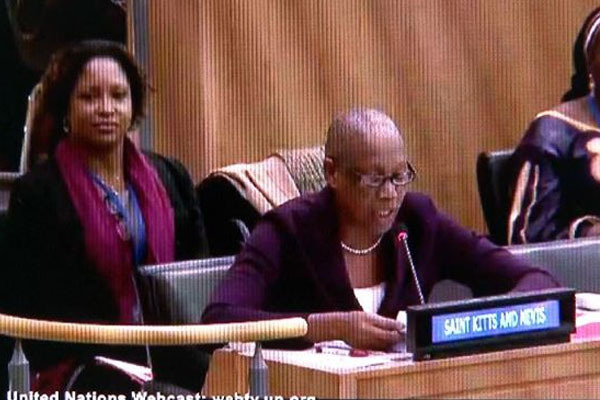 “My Government, therefore, decided a long time ago, in keeping with our Government’s philosophy, that not only would there be no oppression or discrimination based on race in St. Kitts and Nevis, but neither would there be discrimination of any kind – not on class, not on religious affiliation, and certainly not on gender,” Ms. Liburd said. She boasted that although St. Kitts and Nevis is one of the tiniest nations on earth women in leadership roles is not uncommon. “From national security to finance, from investment promotion to tax collection, from our diplomatic corps to our judiciary and our clergy, women in positions of leadership in St. Kitts and Nevis are fast becoming the norm. However, this accelerated pace of change is still not sufficiently reflected in our private sector boardrooms and in Parliament,” she said. Ms. Liburd, a former Speaker of the National Assembly noted that more and more women are assuming positions of leadership, may have a lot to do with the education policy over the past 50 years. “In St. Kitts and Nevis, education has been compulsory and free – both at the primary and secondary level for boys and girls alike. This system of mandatory free education, Mr. Chairman, is both the cornerstone of our country’s socio-economic stability, and an intergenerational national treasure,” she said. She also told colleagues from around the world that in St. Kitts and Nevis men and women, by law, receive the same income for the same work. “Gender based inequities lie in the income differences between men and women generally as on average men traditionally occupy the higher paying jobs in areas like construction while women traditionally occupy the lower paying jobs in manufacturing and home care,” Ms. Liburd said. She said that cognizant of the fact that the majority of single-parent households are headed by women, the St. Kitts-Nevis Labour Party Government has also put in place a carefully developed assistance programme to enable these women and their children to be able to move forward and upward in the areas of housing, post-secondary scholarships and/or grants, and skills training as a means of upward social mobility. “I should, perhaps, mention here also, Mr. Chairman, that so focused are our health care services in St. Kitts and Nevis that maternal and infant mortality are practically unknown,” Minister Liburd said as she highlighted the significant achievements the Federation and the Caribbean region have made in addressing and bringing to the attention of the international community the high incidence of non-communicable diseases and in stemming the HIV epidemic. “Coverage with ARVs has increased from 5% to 67% and new cases of HIV infections among children dropped by 32%. The estimated coverage of ARVs for pregnant women living with HIV increased from 55% to 79%,” she said. She also promoted her government’s legislative support for these policies and programmes such as the passage of the Equal Pay Act, the Guardianship Act, the Maintenance Act, the Child Justice Act and the Human Trafficking of Persons Act – all focus on gender equality and strengthening of the family unit. The current draft amendment of the Domestic Violence Act reinforces a zero tolerance policy. “Violence against women and children must not be seen as either a “personal” or a “family” matter, but instead, it should be seen as socially destructive behaviour demanding judicial intervention by the state,” said Ms. Liburd, a lawyer by profession. The Session she noted comes at an opportune time as St. Kitts and Nevis is at this very important stage of assessing its progress in relation to the MDGs and charting a way forward through the post-2015 Development Agenda.